Last Weekend was spent doing mainly other things but Rich, Dante and myself spent a few hours at Thames Barrier Park where Rich picked out this first Calendar Year Caspian Gull, the first ‘new’ bird of the season! 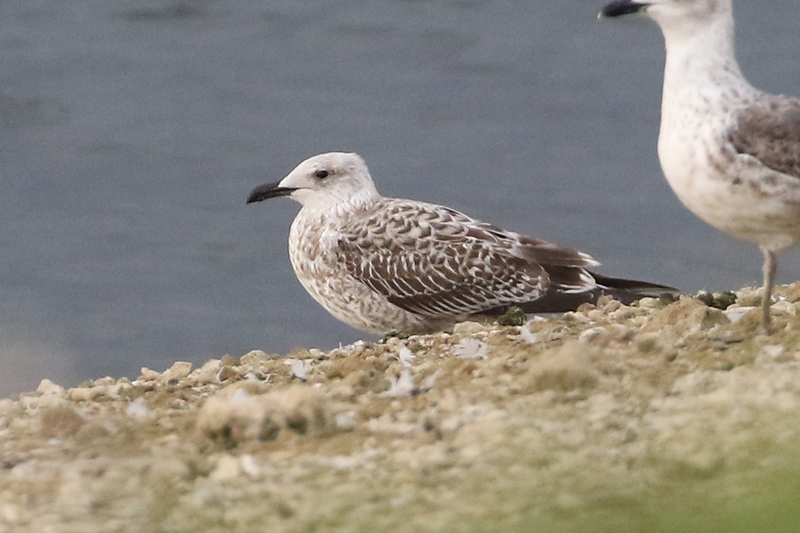 Also present was a first summer bird that last winter we reffered to as ‘Mucky’ and a handful of Yellow-Legged Gulls. Willow Warblers are drying up as Chiff-Chaff numbers build. a few Common and a Lesser White throat have been present. An Adult Spotted- Flycatcher was in willows between number 1 and 2 on the 31st Aug. I’m still seeing one or two first winter Wheatears on the Lockwood and one or two Yellow wagtails over and now a small trickle of Meadow Pipits has begun. Swifts were present in ones and twos untill at least the 4th House Martins have been coming through early monrings and flocks of 2-300 have been feeding high over the southern reses. Hobbys have been present on a couple of mornings in conjunction with this. The marsh has been quiet on my visits, but the local male Kestrel has switched his preferred morning hunting spot from the cow field to horse paddocks. Saturday 3.00 am and I’m on my way to pick up young Dante in a hire car. The final round of the Matin Garner young Birder of the Year was being held at ‘Migfest’ , Spurn. No suprises he won! well done lad. 450 miles driven and 23 hours awake were worth it. There were some good birds turn up on the peninsular, which mainly we didn’t go and see except a tired Wryneck first thing. We had more of a ‘finding’ agenda…so birded away from the crowds but the finding only extended to a few Whinchats down the point and an ad male Redstart up by the Easington Gas terminal-I had ear marked a small group of trees here as a perfect Red-breasted Fly spot Shame it wasn’t something more fitting to the date . Great place though and good vibes. Love the photos and the dialogue…well done!